Nureyev was a highly regarded individual from the time of his birth. A $1.3 million purchase as a yearling by Stavros Niarchos, the bay son of Northern Dancer – Special by Forli came into the world on May 2, 1977 with a silver bit in his mouth. He was bred by the legendary Claiborne Farms in Paris Kentucky. Nureyev would live up to his exulted pedigree when he became the champion miler in France in 1980 and then go on to become one of the best sons of Northern Dancer at stud. The sire side of Nureyev’s pedigree is unquestioned in historical excellence. Descendants branching from Northern Dancer are among the leading tail male sire lines still in existence, with the branch descending from Nureyev being within the mix. 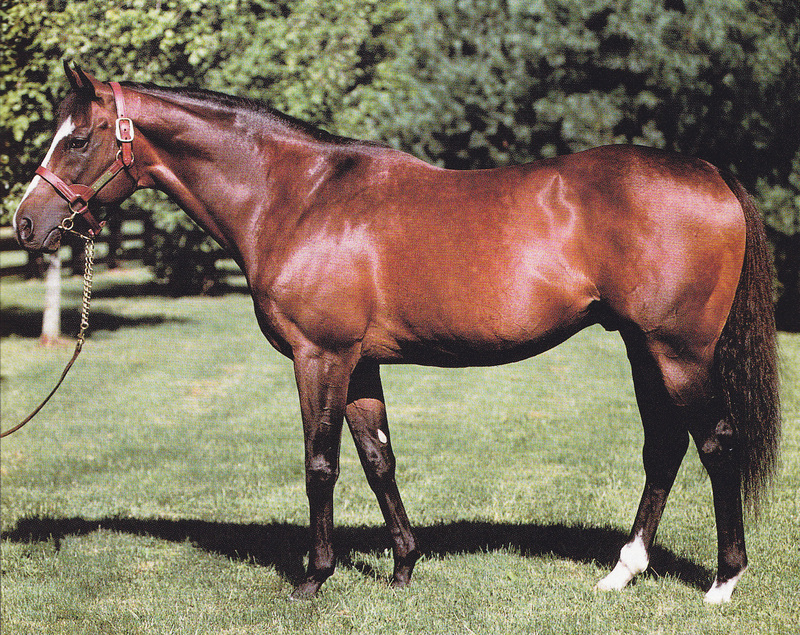 When Nureyev was conceived, Northern Dancer was in the middle of his distinguished career as a leading sire. His dam Special was a granddaughter of the epoch mare Rough Shod, through the latter’s great producing daughter Thong. Special was unplaced in one start. Nureyev was the third foal from Special (her first son) and later produced Number by Nijinsky, who won the Firenze and Hempstead Handicaps before becoming the dam of grade one winner Jade Robbery and grade three winners Numerous and Chequer. A full sister to Number, Bound won a stakes race and then produced grade one winner Archipenko, a current highly regarded sire standing at Lanwades Stud in Newmarket. The first foal from Special was Fairy Bridge, who later staked her claim to fame as the dam of Sadler’s Wells from a cover by Northern Dancer. Also coming from the family after Nureyev was foaled would be champion Blame, the conqueror of Zenyatta in the 2010 Breeder’s Cup Classic, leading sire Geiger Counter, and champion Belted Earl. In the back line of the family along the tail female line of Nureyev consisted of Moccasin, Lt. Stevens, Ridan, Gambetta, Thatch, King Pellinore, Apalachee, Gamely and Drumtop, champions all. With a female family as rich as his, and being a son of the preeminent Northern Dancer, when Nureyev came to the 1978 Keeneland yearling sales it was no surprise that he would fetch the second highest price ever for a yearling at that time. Niarchos sent Nureyev to his trainer in France, the esteemed Francois Boutin, to prepare his expensive and highly regarded steed for racing. Boutin took his time with Nureyev and did not start the colt until November of his two year old season in the group three Prix Thomas Bryon. Nureyev won the race so comfortably that Boutin set the colt down to prepare for the upcoming classics in the spring. Nureyev made his three year old debut in the Prix Djebel at Maisons-Laffitte and won the seven furlong race so impressively that the racing press dubbed him as a can’t miss for the 2000 Guineas. Boutin shipped Nureyev to Newmarket to face a very strong field, which included Known Fact, Night Alert, Tyrnavos and Posse. Nureyev crossed the finish line first displaying his good turn of foot with Known Fact second and Posse third. Nureyev had come across from the outside toward the stand side of the course during the stretch drive where both Known Fact and Posse were staging their respective bids to win the race. An inquiry as to the winner was lodged before the official results were to be posted. The inquiry would take a lengthy forty-five minutes before an official winner was to be declared. Known Fact was declared the winner by the stewards at Newmarket, with Posse placed second and Night Alert third. Nureyev was disqualified. The stewards judged him to have compromised the chances of Posse in the final furlong of the race, however when one looks at a replay of the complete race, we can clearly see that Nureyev was at least two lengths in front of Posse when the alleged foul had been committed. The length of the deliberation and the resulting decision are still considered as one of the more baffling cases to decide a world class race. It was the first time in the one hundred and seventy-eight year history of the 2000 Guineas that the race winner was disqualified from the laurels. To add to the disappointment of the Nureyev camp, this would turn out to be the last race for their star. Boutin was preparing Nureyev for the Epsom Derby, but the colt became stricken with a virus and was unable to make the race. The virus would linger on and with the season rapidly diminishing, the decision to retire Nureyev was made. He had done enough though, in the voters’ minds, to win the champion miler award in France. Nureyev was to begin his stud career at Niarchos’ Haras de Fresnay-le-Buffard in Normandy beginning in 1981. Nureyev stood his first season in France to a full book of high quality mares. From this crop of 1982 foals came group three times stakes winning filly Al Sylah, Scottish Derby winner Eagling, group three stakes winner Lidhame, and multi group three stakes winner Breath Taking. The latter then produced stakes winners Breath Of Life and Bocaivua. Another filly from the first crop sired by Nureyev was an unraced bay to be named Lady Giselle. Lady Giselle later became a broodmare of the year in Australia. She is the dam of the great Zabeel, who recently passed away at his Cambridge Stud home in New Zealand. Group one winner Zabeel was a multi champion sire in both New Zealand and Australia and became the preeminent son of his sire Sir Tristram to carry on the sire line. Lady Giselle also produced group one winner Baryshnikov, Significant Moment who became the dam of group three winner Crowned Glory, and Charming Life a full sister to Zabeel who in turn produced multi stakes winners Wellbeing and Kingfisher Mill. During Nureyev’s first season at stud, John T.L. Jones of Walmac International Farm in Kentucky was successful in organising a syndicate to purchase the highly regarded son of Northern Dancer to stand at his Kentucky farm. Alec Head was instrumental in brokering the deal with Niarchos, and had advised Jones that Nureyev would be a good fit for his stallion roster. As soon as the final price of $14 million was agreed to by the syndicate, Nureyev was boarded on a jet and sent to his new American home. From here, Nureyev would consistently sire top class colts and fillies that won some of the biggest and most prestigious races around the world. Among the top sons of Nureyev were Zilzal, the champion three year old colt in England in 1989 with a Timeform rating of 137 lbs. Zilzal had limited success at stud but did sire Poule d’Essai des Pouliches winner Always Loyal, Sussex Stakes winner Among Men and Prince of Wales Stakes winner Faithful Son. Zilzal passed away this past August due to old age. He was twenty-nine. Spinning World was another champion son of Nureyev. Spinning World became the champion three year old in Ireland in 1996 and champion older horse the following season. His biggest victories came in the Breeder’s Cup Mile, the Prix du Moulin, the Irish 2000 Guineas and twice won the Prix Jacques le Marois. Known for his extremely volatile temper, Spinning World was often photographed wearing a muzzle to keep him from biting his handlers. Theatrical was arguably the best son of Nureyev on the track. Bred by Bert Firestone, the late developing Theatrical won his only start at two, and then would compete against the best of his generation in the classic three year old races. He won the Ballysax Stakes and the Irish Derby Trial Stakes. He ran unplaced in the Epsom Derby and second in the Irish Derby. Following his average three year old season, Theatrical in his four year old season finished second to Acatenango in the Grosser Preis von Berlin, Manila in the Breeder’s Cup Turf and Estrapade in the Oak Tree Invitational. Allen Paulson bought a half interest in Theatrical and the horse was then sent to trainer Bill Mott, to run exclusively in the U.S. Under Mott’s care, Theatrical would shine becoming the Eclipse Award Champion Turf Horse in 1987. He rattled off victories in the Hialeah Turf Handicap, Bowling Green Handicap, Red Smith Handicap, Turf Classic Invitational, Sword Dancer Handicap, Man O’ War Stakes and the Breeder’s Cup Turf. Paulson bought out Firestone’s interest and stood Theatrical at his Brookside Farm in Kentucky. Theatrical had an excellent career at stud getting eighty-one stakes winner, twenty-two of which won grade or group one races. He became a solid source for stamina with his get, which includes Melbourne Cup winner Media Puzzle, Canadian International winner Royal Anthem, Irish Derby winner Zagreb, and Joe Hirsch Turf Classic winner Shakespeare. The latter as well as Geri were also winners of the Woodbine Mile, showing that the top of Theatrical’s get could also display speed to win such a world class race. Theatrical was moved to Hill ‘n Dale Farm in 2001 after Paulson passed away. Theatrical was pensioned from stud in 2009 and died three years later at the age of thirty. Peintre Celebre was the European Horse of The Year in 1997 after his grand win in the Prix de l’Arc de Triomphe, defeating such good ones as Pilsudski, Swain, Borgia and Helissio. He also captured the Grand Prix de Paris and the Prix du Jockey Club during the year. Peintre Celebre has had a good sire career standing at Castlehyde in Ireland, part of the Coolmore empire, with twelve grade/group one winners to his credit including Pearl Of Love, Bentley Biscuit, Castledale, and multi G1 winner Pride. He was recently pensioned from stud duty following last year’s breeding season at the age of twenty. Two more champion sons of Nureyev are Stravinsky the 1999 European Champion Sprinter, and Fasliyev the European Champion Two Year Old in the same year. Both sons of Nureyev began their stud careers at Coolmore in Ireland and then moved on to Japan. Fasliyev died in 2013. Additional grade/group one stakes winners by Nureyev are Alwuhush, Atticus, Good Journey, Gracioso, Heart Lake, Joyeux Danseur, King Charlemagne, Kitwood, Senure, Skimming, Soviet Star, Special Ring, Stately Don, and Wolfhound. Unusual Heat was a minor stakes winner three times in his racing career but has been nothing short of sensational as a regional sire in California. He has sired forty-four stakes winners so far in his career. Among those are Acclimation, three time winner of the grade one Charles Whittingham Handicap, the Pacific Classic and the Eddie Read Handicap twice. Polar Falcon won the Lockinge Stakes, the Ladbroke Sprint Cup and the Prix Edmond Blanc. Polar Falcon retired to Cheveley Park Stud in 1992 and sired twenty stakes winners before his early death at the age of fourteen due to a suspected lung tumour. He has however sired Nunthorpe Stakes winner Pivotal. From Polar Falcon’s first crop, Pivotal has been the key link to continue the tail male line descending from Nureyev today. Standing at Cheveley Park, Pivotal has been one of the leading sires in Europe for almost a decade now. Among the top get sired by Pivotal are Poules d’Essai des Poulins winner Falco, Coronation Stakes and Prix Jacques le Marois winner Immortal Verse, Epsom Oaks and Irish Oaks winner Sariska, two winners of the Pretty Polly Stakes in Izzi Top and Chorist, and three winners of the Lockinge Stakes in Peerless, Virtual and Farhh. Pivotal is also the sire of African Story, this year’s winner of the Dubai World Cup, Excellent Art who won the St. James Palace Stakes, Kyllachy won the Nunthorpe Stakes, Halfway to Heaven was the victoress of the Irish 1000 Guineas and the Nassau Stakes, while Buzzword captured the Deutsches Derby and Siyouni took the Prix Jean-Luc Legardere. Looking at the daughters of Nureyev we have to begin with perhaps his greatest offspring on the track, the wonderful Miesque. Already featured on this web-site in an article devoted to her life, I will simply repeat her major achievements. Miesque won the Breeder’s Cup Mile twice, the Poules d’Essai des Pouliches and the 1000 Guineas among her ten grade/group one stakes wins. She is also the dam of classic winner and influential sire Kingmambo. Annoconner won the Vanity Handicap, Flagbird took the Pretty Polly Stakes, Irish 1000 Guineas winner Mehthaaf, No Matter What was victorious in the Del Mar Oaks as well as Hollywood Oaks winner Pattern Step are more grade/group one stakes winning daughters of Nureyev. Sonic Lady won three group one races including the Irish 1000 Guineas, the Sussex Stakes and the Prix du Moulin. She was champion three year old filly in Ireland and France and also champion miler in Ireland. As a broodmare Sonic Lady produced multi group stakes winner Hazaam and is the grand dam of multi graded stakes winner Northern River. Reams Of Verse captured the Epsom Oaks and the group one Fillies Mile before producing Valedictory Stakes winner Eagle Poise. Crystal Music would become the second daughter of Nureyev to win the Fillies Mile and is the grand dam of multi group stakes winner Ocovango. Nureyev is also the broodmare sire of Canadian Triple Crown winner Peteski, Kentucky Derby winner Big Brown, Irish Derby and Irish 2000 Guineas winner Dessert King and European Champion Three Year Old Bago. Grade one stakes winner Somali Lemonade, multi group stakes winner Loup Sauvage, Prix d’Ispahan and Prix du Moulin winner Maxios, Coronation Stakes winner Rebecca Sharp, multi graded stakes winner Northern Afleet, Gazelle Handicap winner Tap To Music, Queen’s Plate winner Niigon, and Fillies Mile and Matron Stakes winner Rainbow View are a small sample of the two hundred and fifteen stakes winners which Nureyev is credited as a broodmare sire. On May 5, 1987 Nureyev suffered a serious life threatening break of his right hind leg. The gruesome injury was so severe that he was given less than a ten percent chance to survive. Dr. J.D. Howard, the resident veterinarian at Walmac, was summoned from his office to Nureyev’s paddock where the accident had taken place. Upon his arrival he immediately thought that there was no way the great stallion could be saved. Dr. Howard: “The part just below his right hock in the joint was like it was on a swivel. It just flopped and I thought there was no way”. What would follow would be months of painstaking surgeries employing the most advanced surgical techniques, meticulous care, and long desolate days of patience and hope from not only the veterinarian team, but also Nureyev’s handlers and Nureyev himself. One crisis after another would befall the horse during the long and arduous recovery. At times it seemed hopeless. To complicate matters, the numbness from the pain after the surgery, which consisted of four well placed screws to stabilise the broken joint, as well as possible nerve damage, was hard for the team to assess if Nureyev was on the path to recovery. The injured stallion was supported in a specially designed sling so he could have some sort of movement. But after seven weeks, in which the cast was replaced four times to avoid cutting off the blood flow to the injury, Nureyev under the constant strain was beginning to show signs of giving up. The team would have to slap Nureyev across his face to anger him and get him to stop slumping in the sling. The horse could not lay down for a good sleep while in the sling. The doctors feared that if he was allowed to, he would damage his leg beyond hope. Nureyev was suffering from sleep deprivation, as well as the constant pain and inherent fear of his situation. As time rolled on with Nureyev supported in the sling, Dr. Howard could plainly see the stallion failing. Nureyev was losing his will to fight. The recovery had come to a crossroad. Dr. Howard then had to take a leap of faith and try something to encourage his patient to have hope. Howard had an eight inch thick padded mat brought over and then placed it under Nureyev. He then slowly lowered the horse in the sling, all the while talking and petting him in a calming manor, and gently laid down Nureyev on the mat. Nureyev could now finally have a comfortable rest. Each day Dr. Howard would perform this routine with Nureyev, allowing a little longer time on the mat each day. This seemed to encourage the stallion and renew his sense of survival. In August the cast was removed for good and was replaced with a specially designed brace to support the leg. The brace gave Nureyev more freedom of movement and, more importantly, less pain. In September the brace was then weaned from Nureyev gradually. He was allowed outside his stall for the first time since this ordeal had begun five months earlier. He was hand walked about thirty feet on the first day, gradually increasing the distance to about two hundred feet. This was to avoid muscle atrophy which was another fear for the medical team. Two months later Nureyev returned to a specially built stall waiting for him at Walmac which had direct access to a breeding shed of his own. He beat the odds and survived. He returned to his breeding duties the following February, and would continue until his passing in 2001. There are many people to thank for their committed dedication in saving Nureyev such as lead vet Dr. J.D. Howard, Dr. Paul Thorpe, Dr. J.D. Wheat, Dr. Michael Spirito, and Dr. Craig Franks. Walmac staffers Kenneth Aubrey, Aida Bossio, Nureyev’s groom Wayne Reinsmith and assistants Greg and Jeff Banks. Mike Farly who constructed the leg brace and blacksmiths Steve Collins and David Nadeau were also crucial in Nureyev’s recovery. I tip my cap to all. Nureyev’s bravery was undoubtedly considerable. Lesser horses would have given up completely through such a harrowing time. He was able to pass on his bravery, class and speed to one hundred and thirty-five stakes winners in his stud career. His sire line lives very well through the outstanding Pivotal, one of the top ten sires in the world today. Nureyev was on the small side, standing 15.2 ½ hands. He had the look of his sire with a muscular build but with a longer back. His bay colour was similar to Northern Dancer but his facial markings had more white. He had a large star on his forehead that continued into a wide blaze that went down to his nostrils. He also had white socks on his hind feet. He was energetic with a good disposition, though his playfulness could be dangerous if one was not careful. Born to be great, Nureyev, who was named in honour of the famous Russian ballet dancer, was truly great on many levels. His survival from an injury that would have destroyed the heartiest of equine souls was a stunning miracle. He slammed death’s door and lived on. Nureyev’s bravery, intelligence, heart, speed on the track and impeccable pedigree bear proof of his greatness, through many champions’ pedigrees around the world. I have the ONLY Entire Son of EAGLING/by Nureyev in the World, he is nearly Black. his studbook name is ULTIMO RAE(means The Last King). I am in South Australia. His stable name is KING he is now an 8 yr old, but due to not having money he is still unbroken but handled. He s a very swift mover and has a lovely temperament. Hi Valerie are you standing him? CORRECTION ULTIMO RAE IS THE ONLY ENTIRE GRAND SON OF EAGLING, ULTIMO RAE IS BY MY LATE TB TARQUIN SILK WHO WAS PUT TO SLEEP 31st JANUARY 2018 due to a severe I impaction I’m HEARTBROKEN HE WAS A SUPERB HORSE A FABULOUS COMFORMATION AND TEMPERAMENT bred by me Valerie Sumner, in Adelaide,South Australia. Found it very interesting to hear the great Lester Piggott say during a recent programme aired on Tellytrack RSA that Brigadier Gerard was, for him. one of the greatest. My favourite of all the Nothern Dancers. Remarkable story of dedication to save a horse. Nureyev’s survival was a longshot. Great recap of the events. Thanks for the story Colin, really enjoyed it.